THANK YOU TO EVERYONE FOR A MAGICAL TRIP! for giving their time and keeping everyone safe. and the parents for their support! our Epcot performance on the NH Choir YouTube channel. 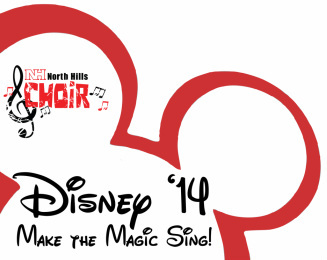 The North Hills High School Marching Band and Choir will travel to Orlando, Florida for performances, fun, and sun during the last week of April. The Band will march down Main Street in the parade, the choir will participate in workshops and perform in one of the parks, and we will enjoy 3 days in the Disney theme parks. More details will be coming during the first few weeks of school, including tentative itineraries, required paperwork, deadlines, and costs. Check back often for updates and details. This is the biggest trip the choir has taken in many, many years, so we are very much excited, and grateful to NHSD Administration and School Board for allowing us to have this opportunity to travel and make music together! 1. The Polos. We have ordered red polos that will be embroidered with the NH Choir logo in black and white on them. These polos are considered uniforms and are being purchased through the choir budget. They must be returned after the trip. If you would like to keep it, you must pay $20 to cover the cost. 2. Khakis. For our performance at Epcot on Friday, April 25, we will be wearing the red polos with khaki pants. You must provide these. For the girls, the sooner you buy them, the better, as shorts are starting to be sold in most stores. They don’t have to be expensive, just actual pants. Disney is very strict about having uniform performing groups and since our trip choir is made of students from 3 different groups, the polo/khaki combo was the best option for us (there’s no way we were wearing robes!). 3. T-shirts. The same clipboard went around classes asking for T-shirt sizes. If you put a size, then it is assumed that you are buying a shirt. They are $10 each, and money can be turned in ASAP to the appropriately labeled drawer in the unit. You must pay before you receive the shirt – and the plan is to wear them to school on Tuesday, April 22nd. The band has a shirt that is the same color as well, so there should be close to 250 of us in the school all wearing blue Disney shirts. 4. Medical forms. NHSD has created a new medical/emergency contact form that we must have completed for all overnight trips. It includes medication that may not be on your school emergency card since you may only take it at night or after-school hours. These completed forms will be due to us on the night of the final trip meeting, April 15th. 5. Buses. We’ll have 2 buses for the trip – a large and a smaller one, both Anderson coach buses. Sign-ups for the buses will happen in the next 2 weeks. The choral parents will provide bottled water on each bus. If you would like to bring snacks for the drive, you may do so. Just make sure to clean up after yourself. We will be on these buses for a very long time together! 6. Rehearsals: There will be 3 after-school “Disney Choir” rehearsals, where only those going on the trip will attend so that we can establish balance and make sure our performance is as polished as it can be. They are 2:00-3:00 on Monday, April 14 and Thursday, April 16 and 2:00-3:30 on Monday, April 21. 7. Final Trip Meeting for Families. We will have our final check-in meeting to go over the itinerary, collect medical forms, introduce chaperones, talk about medication turn-in, luggage drop-off, and any other details. This meeting takes place at 7:00pm on Tuesday, April 15 in the high school auditorium. 8. Medication/Luggage Drop-off. The high school auditorium will be open from 6:00-8:00pm on Monday, April 21 to drop off luggage, medication, uniforms, etc. We are leaving only an hour after dismissal on Tuesday, so there really isn’t time to ride the bus home and come back before departure. 9. Band/Choir Crossover Students. Any student who is in the marching band that also sings in the choir is able to be a part of both our workshop and performance. We planned the trip together and coordinated times that work for both groups as well as transportation when needed. The choir workshop takes place on Wednesday night while the band is just in their hotel rooms, and the band will watch the choir performance on Friday, so anyone in both can easily do all parts for each group. Even though on paper we’re doing separate trips with money and hotels, it’s the same trip!